Today Marianne and I went to Tampa to do yoga at a new location. 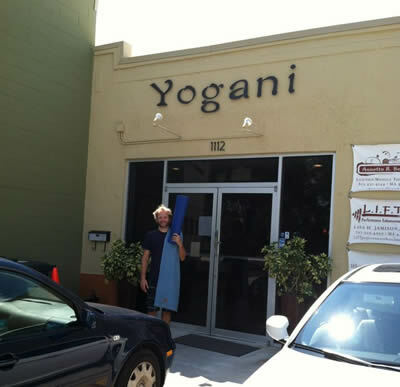 The place was called Yogani and the instructors name was Annette. It was a hot yoga probably over 100 degrees. It was great to once again continue out of the normal routine and experience something new. The instructor came across very militant and continued to stress how she was going to push us to our edge. If you read some of my past blogs my mind set has been to start to back off and to be gentler to my body and thus my mindset. She did have a very interesting outlook and philosophy that stressed that if you can find breath in the most uncomfortable places on your may then you can also find this off the mat. She had a very interesting approach and you could tell that she loved yoga and that yoga had helped her out in many ways. She was a real instructor. The people I appreciate most in this world are the people that come to work and to the mat as themselves. So for this I enjoyed her personality and her class. For some people yoga is about pushing themselves to the edge. At times this is me. For others it is a time to find peace and relaxation. For me right now it is a time for me to be more kind and gentle on myself. I feel like I have been very hard on myself over the last few years and yoga is an opportunity to ease this habit. The curve ball I had during class today is that when I get into a new class I typically say to myself... “I have to prove to all these people that I am strong, flexible, and know what I am doing.” Today was a great opportunity to drop that and say, “No one knows anything about me, I can be as gentle as I want.” But the instructor was pushing to find the edge. So this was my test today. In the class the first thing was the heat. I for some reason did not find it too hot today. Second was the breath. Today I could not find my breath, but did not look for a mental relaxation day. Then came the outward thoughts. “People are looking at me.” “I should show them that I am good.” “I am supposed to stay gentle though.” I was still fighting this today, but I found it more on the forefront of my mind. Overall I was much more gentle than I would have been in the past. Did I find complete gentle comfort? No, all in good time. Are there thoughts that keep coming back to you? Why do they keep coming up in your mind? Are they telling you something? Email me or leave a comment.